​Domain 1: Planning and Preparation. These are examples of Sacred writing, as well as one of the many prompts my students received one Friday. "Sacred Writing Journals" are composition books that the students were given time to write in every Friday, the purpose of this is to allow them to free write for 5-10 minutes about anything they would like to write about. Every Friday they would get a prompt, something along the lines of, "Write about someone who has been an inspiration to you", or the "Envision a Dragon" prompt below, these prompts were simply suggestions from me in case they were unsure what to write about that week. The students had the freedom to write to the prompt or choose something else. Many students wrote continuous short stories and added to them each week, while other students wrote about how their weeks had gone, or trouble they might be having at home. Every month I collected these journals and read through the different entries, if a student did not want me to read something personal, all they had to do was fold that sheet in half and I would know that they wanted to keep that information private. 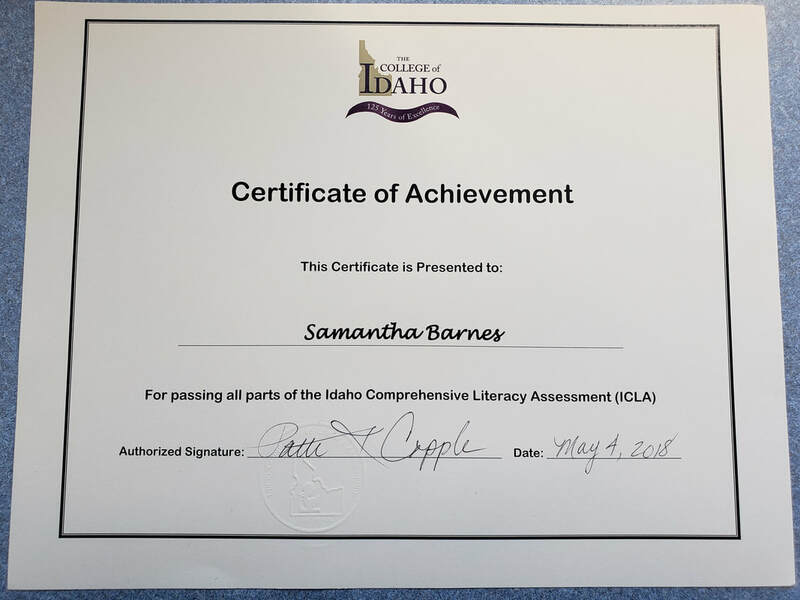 ​For this subcategory I have included my ICLA certificate. In my undergrad and graduate school career I have developed the skills to pass all three exam credentials. This assessment is a measure of basic literacy skills for reading, writing, and math. These skills are integral to successful teaching. The content within the ICLA exams is content that will be applied in the teaching world on a daily basis. Below is an example of a test that I created for my ELA students during the first semester of my student teaching. This was created using knowledge of my students abilities, knowledge of the content and resources they were interacting with throughout their Big Burn Unit, and what information they may need to have for their Socratic Seminar at the end of the Unit. Directions: Choose the best answer to the following questions. 1. Who is showing Jarrett how to do his new job? 2. Which of the following did Celia and Lizabeth NOT discover from visiting Samuel’s home? a. Samuel has a sense of humor. b. Samuel doesn’t keep a clean house. c. Samuel likes to scrapbook. 3. What is one challenge Lizbeth and Celia are facing? a. They are fighting a fire at their homestead. b. They are isolated from everyone. c. They don’t know how to cook. d. They can’t get food for their livestock. 4. What made Jarrett get sick? a. He saw a man who had been injured and burned. b. He ate bad jerky. c. He caught a virus. d. He has an infection. 5. Who did Lizbeth run into in Wallace?